Store cleaning products, gardening tools or hobby and DIY items with ease using this brilliant Beldray caddy. A handy all in one storage solution, it has a central handle which makes it easy to carry and the lid clips firmly shut so you can store your products without worrying about spills. 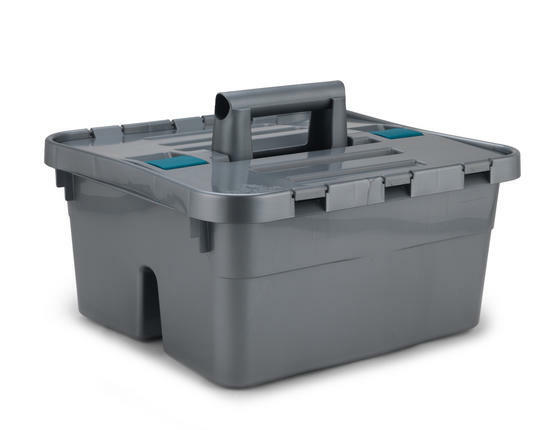 Measuring 38l x 35w x 25h cm, it is easily stackable so you can keep your home neatly organised while the grey plastic design will keep the contents hidden, great for keeping cleaning products from children. Keep your home neatly organised with this fantastic Beldray caddy, ideal for storing household products, hobby items or DIY tools. The lid clips firmly shut so you can safely store cleaning products or transport your items without worrying about spills. An all in one storage solution, the caddy measures 38l x 35w x 25h cm and has a central handle so you can carry your items with you. Compact and convenient, it is wonderfully stackable and is made from smart looking strong grey plastic to keep the contents protected. The perfect way to keep your cupboards tidy, it is ideal for home, university or carrying your tools between the garden and the shed.